Getting out of debt can be difficult. You will have to develop a plan and stick to it if you want to pay down or get out from under the crushing weight of too much debt. If you are unable or unwilling to get rid of your credit cards, at least stop using them for things that will depreciate in value, such as clothes, meals out and vehicles. Go shopping with cash instead of cards to avoid overspending on impulse buys. If the circumstances are right, you may be able to get a part-time job and use those checks to pay towards your debt. Part-time at minimum wage may not sound like much, but when you can chip away at debt a few hundred at a time, it will certainly make a difference. Some people become addicted to overspending and accumulate large amounts of debt. 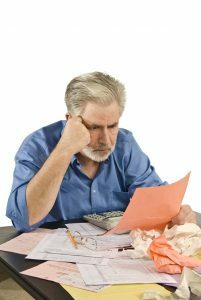 If you think you may have a spending problem and are considering filing bankruptcy to eliminate your debt, examine your motives to ensure, you won’t find yourself in the same situation after the bankruptcy. Debtors Anonymous has a questionnaire to help you determine if you have a problem with debt. If you answer “yes” to at least 8 of the questions, you may be a compulsive spender. Are your debts making your home unhappy? Has the pressure of your debts caused you to consider getting drunk? Have you ever borrowed money without giving adequate consideration of the rate of interest you are required to pay? Do you usually expect a negative response when your subject to a credit investigation? Do you justify your debts by telling yourself that you are superior to the “other” people and when you get your “break” you’ll be out of debt? To find a support group in your area, check out the Debtors Anonymous website. You can also find information on handling your debt on the site. If you are dealing with overwhelming debt and need a fresh start, contact a McAllen bankruptcy attorney to find out what can be done to help you in your situation.